CARPE DIEM: Markets in Everything: Shared Commuting Buses; "The Google Shuttle Buses For the Rest of Us"
Markets in Everything: Shared Commuting Buses; "The Google Shuttle Buses For the Rest of Us"
Recruit and retain top talent. Give your employees a commute experience they look forward to. Ridepal takes all the hassle out of getting employees from home to work and back again, safely and comfortably. RidePal offers state-of-the-art shared commuting buses with wi-fi along with a ticketing, reservation and management platform. It makes it convenient, enjoyable and productive for people to get to work and back, and is an eco-friendly alternative to driving. Businesses or commuters themselves only pay for the capacity they need, so are able to offer more choices for employees without worrying about logistics or paying for an entire bus. This comes with little overhead as it is easily managed through our self-service web interface. 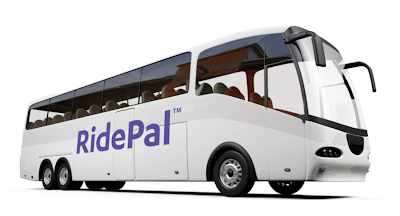 MP: RidePal (described as the "Google Shuttle for the rest of us," in reference to Google's fleet of 32 shuttle buses that transport more than 1,000 Google employees to work every day) currently operates on 15 routes in the Bay Area, and just raised $500,000 in seed funding to expand its operations to 20 metro areas. Sounds like a great idea. Just the kind of thing a local public transportation workers union will press politicians to strangle to death. Microsoft has an extensive bus system called the Connector to get employees back and forth to its big campus. Microsoft might have to upgrade its buses to compete with the large Google presence in the Seattle area. Here in California we should do this instead of High Speed Rail. For what HSR is going to cost us we can give away these bus rides throughout California. I ride to work in a small commuting bus, it's called a van pool. How may I locate the bus stops in the East Bay?